Wellington is the capital and second largest urban area in New Zealand. Located by the sea and surrounded by green volcanic hills, Wellington offers a dramatic and exhuberant natural scenery in the south of the NZ’s North Island. Wellington has been the capital of New Zealand since 1865, when it took the title from Auckland, largely because of its more central position and its excellent port conditions. As headquarters of New Zealand’s central government, all Kiwi main institutions, foreign embassies and international organizations are based in Wellington. While it is the second most populous city in New Zealand, Wellington has less than half a million people in its metropolitan area. Its urban centre is perfectly accessible on foot and the most important suburbs are connected by an efficient light rail and tram system. Wellington boasts an attractive British colonial architecture in its compact urban centre, with examples of Georgian, Victorian and Art Nouveau styles, it is also home to lots of modern-style buildings, mostly built in the second decade of the 20th century. The capital of New Zealand has the third largest airport in the country, and it’s considered the gateway to explore the south of the North Island. In consistency with Auckland and the rest of New Zealand, accommodation prices in Wellington are usually high, and the average 3-star hotel in the city usually can be found at around 90 NZD (USD65/£48/€55) per night. The high season in New Zealand’s capital stretches around the austral summer, Christmas and New Year holidays. Wellington hosts countless sporting events throughout the year, during which hotel prices soar to astronomical levels. A bed in a cheap hostel in Wellington is usually around NZD 30 per night. When it comes to districts, the best area to stay in Wellington is definitely the CBD, because of its central location and access to the main attractions of the city. 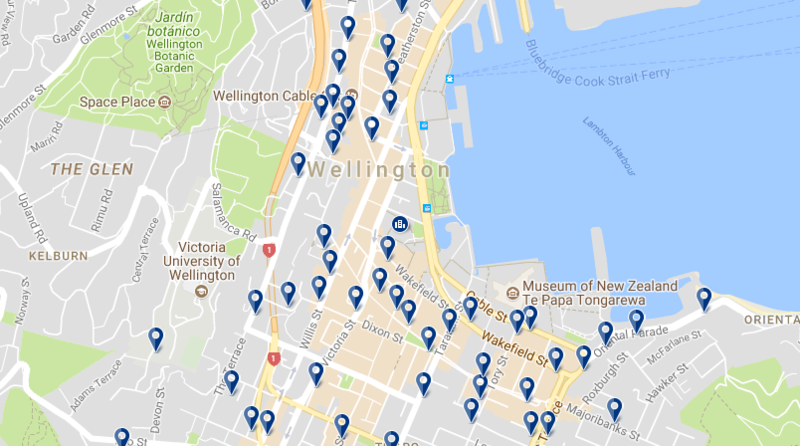 See all hotels in Wellington’s CBD. Esta es una lista con las mejores zonas para dormir en Wellington, Nueva Zelanda. 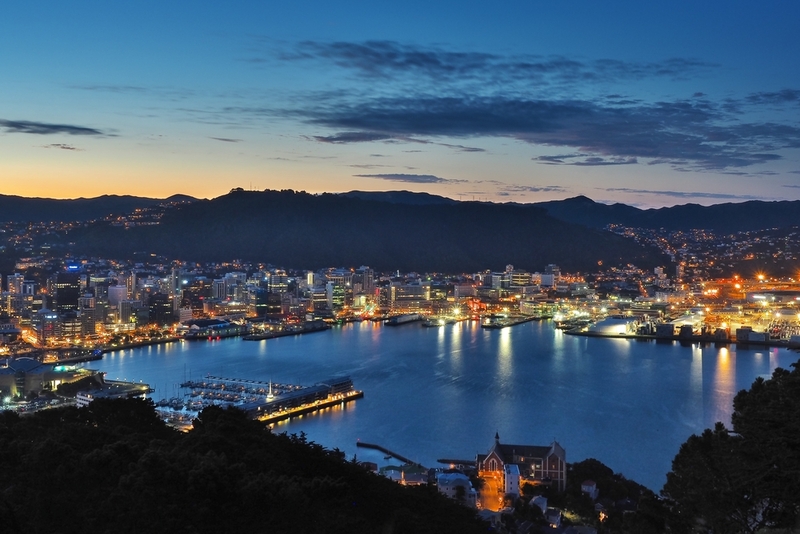 Wellington CBD (Central Business District) is located next to Lambton Harbor and surrounded by green volcanic hills. 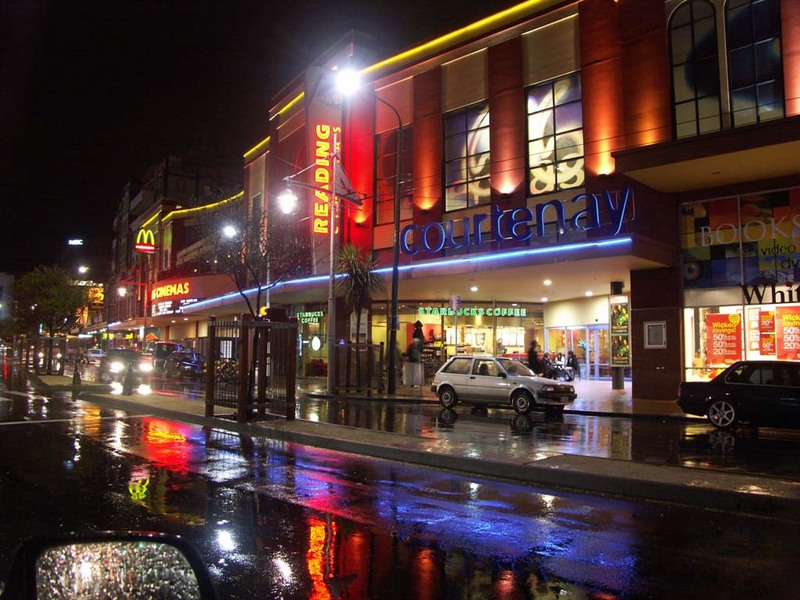 It is the most important business, nightlife and shopping area of the city. Many of Wellington’s tourist attractions are located in or around the CBD, including the Museum of New Zealand, the Maritime Museum, the Botanic Gardens, or major New Zealand government institutions such as the New Zealand Parliament or Government House. Central Willis Street is one of the most important shopping centres in the city, with many local and foreign brands. Given its political importance as a business centre, the CBD has the largest concentration of Wellington hotels and ccommodations. 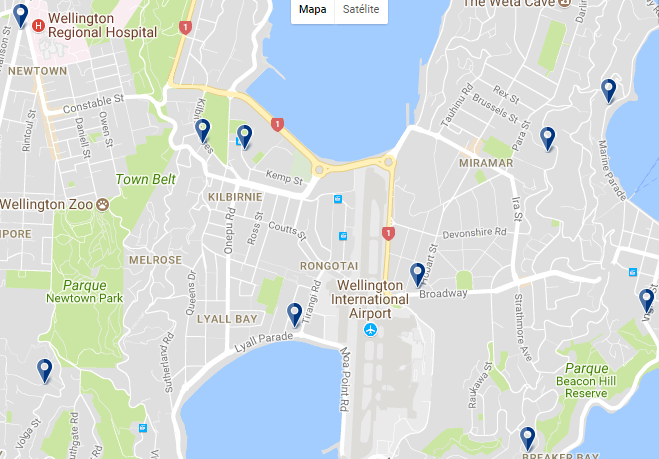 Properties in this area tend to have higher rates than the rest of the city, but it is definitely the best area to stay in Wellington if you are looking to be close to everything. Gilmer Apartment Hotel is just a 5-minute walk from the seafront and offers apartments equipped with kitchenette, fridge and microwave. Westpac Trust Stadium and Te Papa National Museum are a 15-minute walk away. It offers free WiFi. – from NZD 109. Halswell Lodge is a 9-minute walk from the beach. Halswell Lodge is next to Courtenay Place, in the center of Wellington. All rooms include satellite TV with 7 movie and sports channels. Free unlimited WiFi is provided. – from NZD 86 . West Plaza Hotel is a spacious 5-storey hotel located in Wellington’s business district, just 3 minutes’ walk from the Te Papa Museum. The hotel has an award-winning restaurant, 24-hour reception and luggage storage. – from NZD 120 . InterContinental Wellington is a 3-minute walk from the beach. It is a 5 star establishment located on the seafront promenade. It has an exclusive club lounge, a gym, 2 restaurants and a bar. – from NZD 207 . Lambton Quay (formerly called “Beach Street”) is the heart of Wellington’s financial district. Originally, as both names indicate, this was the area where the city met the coast. Lambton Quay was the site of the 1840 settlement from which the city of Wellington developed. Lambton Quay is named after John Lambton, the first Earl of Durham, the first president of the New Zealand Company. 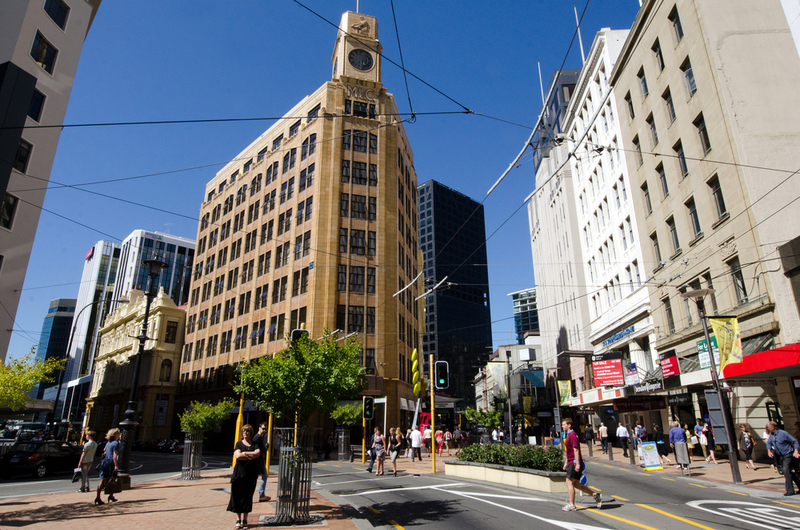 Lambton Quay, Willis Street and Courtenay Place are locally known as “The Golden Mile”. 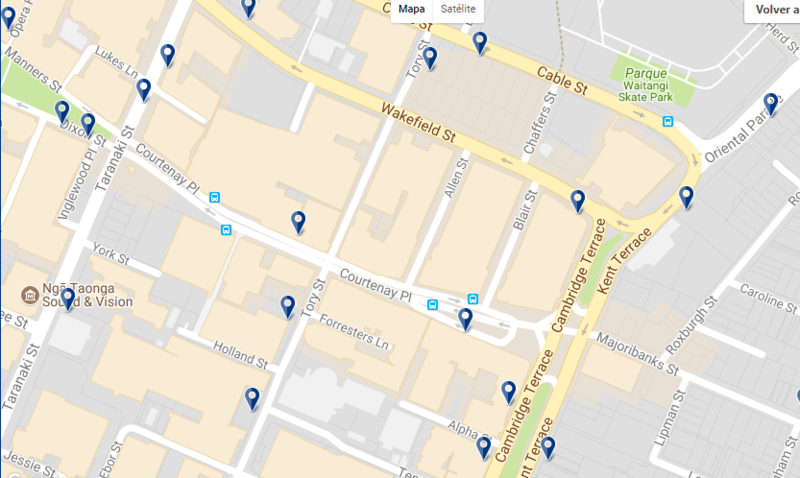 Much of the city’s trade is now a little further south around Manners Street and Cuba Street, but Lambton Quay remains a major commercial thoroughfare. 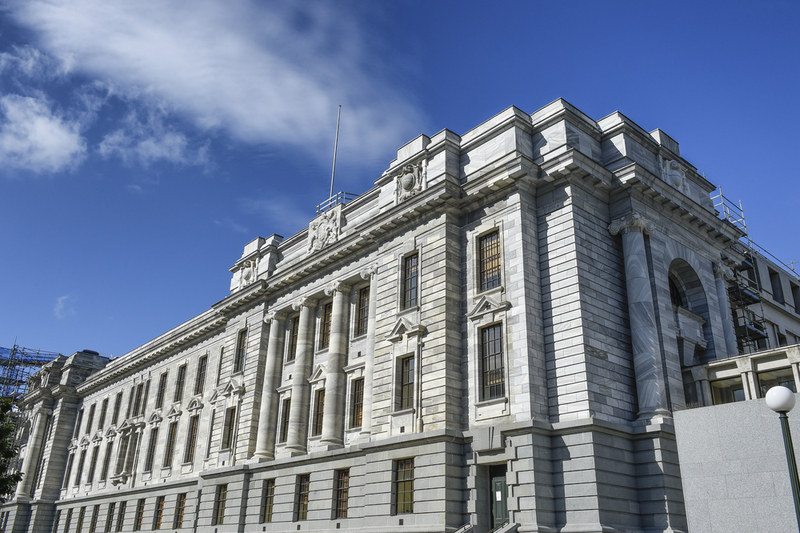 It is also of administrative importance, with the New Zealand Parliament buildings at its northern end. The Wellington Cable Car runs from Lambton Quay to the top of the Botanical Gardens. 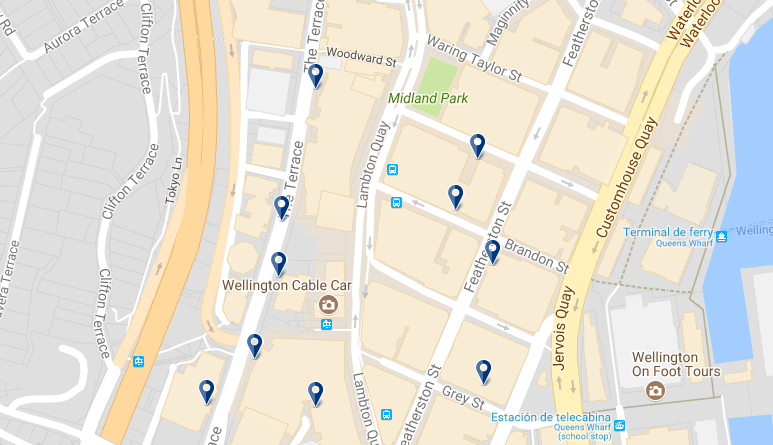 It is the most central area to stay in Wellington. Park Hotel Lambton Quay is located in the heart of Wellington, just 200 metres from the cable car. It offers a restaurant, a bar and free Wi-Fi throughout the building. There is a private car park. – from NZD 179. Courtenay Place is the main street of the Courtenay neighbourhood in the Te Aro district of Wellington. Courtenay Place is known for its entertainment and nightlife. Many restaurants are open until late and most bars remain open until dawn. 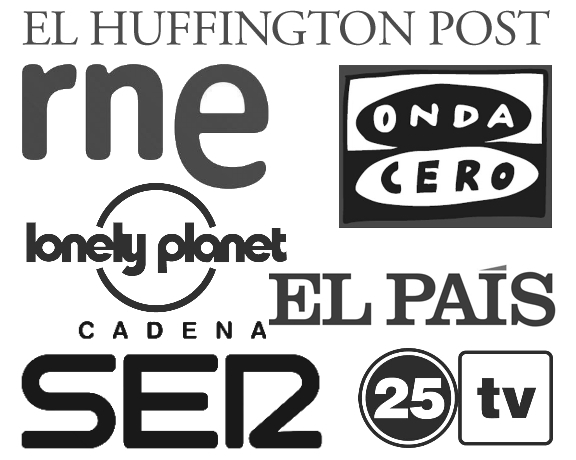 It is an area of offices, hotels, shopping, entertainment, food and artists. Courtenay Place is active all day, but it is during the night when it really comes to life. It is one of the best areas to stay in Wellington if you are looking to be close to the best nightlife in town. Liberty Apartment Hotel offers free Wi-Fi and is located in Wellington city centre, 300 metres from lively Cuba Street, a popular shopping and dining area. Private parking is available on site. – from NZD 158. The Setup on Dixon – Hostel offers free Wi-Fi and is located in the centre of Wellington, less than a 5-minute walk from various restaurants, cafes and shops. – from NZD 29. 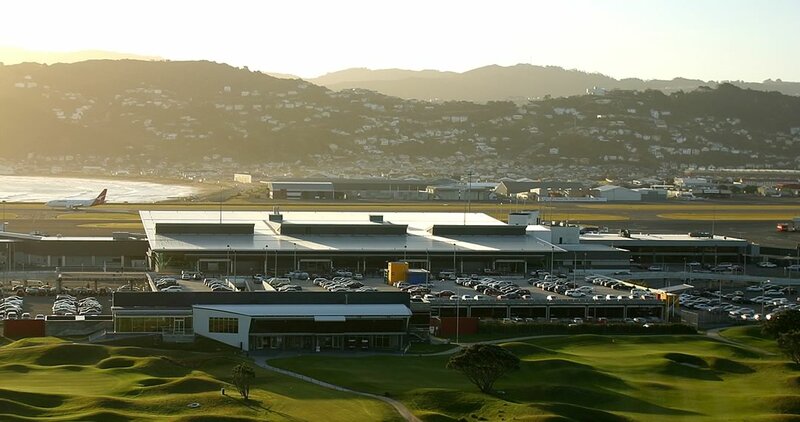 Wellington International Airport (formerly known as Rongotai Airport) is an international airport located in the suburb of Rongotai. It is located 5.5 km southeast of the city centre. It is a hub for Air New Zealand and its subsidiaries. Wellington is the third busiest airport in New Zealand (after Auckland and Christchurch) and handles a total of 5 million passengers a year. The airport, in addition to connecting many New Zealand destinations with national and regional operators, also has links Wellington to major cities in eastern Australia. Wellington International is connected to the city centre via buses. It’s a good area to stay in Wellington if you need to be at the airport early. Airport Motor Lodge is located just 650 metres from Wellington Airport, it offers soundproofed accommodation and free parking. A free airport shuttle is available from 7:00. – from NZD 165. Although Lower Hutt is technically its own city, its proximity to the New Zealand capital, as well as its accessibility by train, make it an excellent area to stay in Wellington. Lower Hutt is located 10 miles northeast of Wellington, by the Hutt River. It is a relaxed and quiet city of little more than 100 thousand inhabitants. Unsurprisingly, the accommodations in Lower Hutt tend to be much cheaper than those in the centre of Wellington. 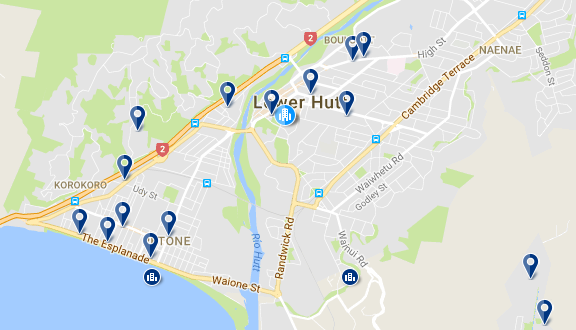 Quest Petone is located in Lower Hutt, 11 km from Wellington. It has private parking. All rooms include a TV, kitchen and free Wi-Fi. – from NZD 124.